Apart from setting enrollment triggers to add contacts to a workflow when they submit a specific HubSpot landing page or website page, you can also add contacts to a workflow from the form module in the page editor. In your HubSpot account, navigate to your landing pages or website pages. Hover over a page with a form and click Edit. In the content editor, click the form module. In the left panel, click to toggle the Add to workflow switch on. Click the Workflow dropdown menu to select an existing workflow, or click Add new to create a new workflow. In the bottom left, click Save and go to module list. In the upper right, click Publish or Update to take your changes live. The form submission on the page will be added as an enrollment trigger to the selected workflow. If you click to toggle the Add to workflow switch off in the form module on the HubSpot page, the form submission on the page will be removed as an enrollment trigger from the workflow. If you manually remove the form submission as an enrollment trigger from the workflow, the Add to workflow switch in the form module will remain toggled on. However, contacts who submit the form on the page moving forward will not be enrolled in the workflow. 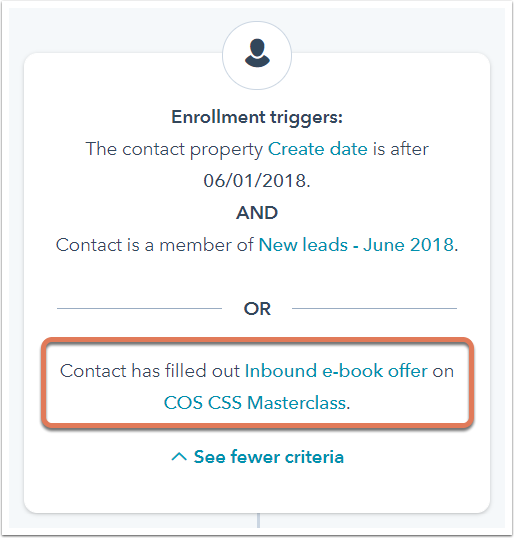 When you clone a HubSpot page with a form that adds contacts to a workflow, the form submission on the new, cloned page will be added as a new enrollment trigger to the workflow.